We pride ourselves in providing only the very best in quality made rebar products that can keep your projects ahead of schedule and under budget. From transmission line foundations to high rises, bridges and warehouses, we do it all. Residential and commercial, non-union jobs as well as the largest private and government union jobs. Our highly experianced ironworkers can provide assembly for cages of any shape, size or length. 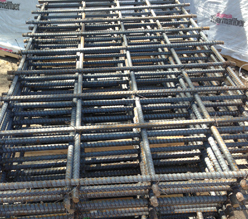 At DMJ Industrial Services, we pride ourselves in providing only the very best in quality made rebar products that can keep your projects ahead of schedule and under budget. Serving all of New Jersey and expanding on a daily basis. 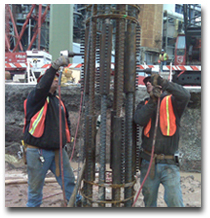 We offer applications from transmission line foundations to high rises, bridges and warehouses. DMJ offers off-site assembly, so if your project has limited space for on-site assembly or just want the peace of mind knowing that all of your rebar cages, columns, beams, walls, and slabs are ready before you are. We can provide all of your rebar needs from residential/commercial, non-union jobs to the largest private and government union jobs. 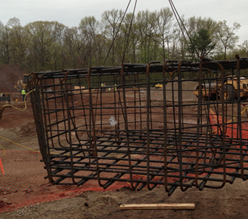 With our ability to build and deliver caissons from 6 inches to 12 feet in diameter, we can provide assembly for cages of any shape, size or length, with our team of highly experienced ironworkers ranging from 15 to 30 years of onsite fabrication and installation experience. We can pre tie or weld and deliver just about any rebar application from footings, dowels, walls, slabs to bridge parapets and piers.